Photo by U.S. Fish & Wildlife Service The worm-eating warbler is one of the more nondescript warblers. It’s September, which for me signals the autumn migration season of warblers and other neotropical birds. The warblers are a family of small songbirds that also happens to be the main reason I enjoy bird watching. Although warblers can be a challenge to observe and a puzzler to identify, they’re bundles of multi-colored feathers brimming with high-octane energy as they forage in treetops, along woodland edges, in weedy fields and around ponds and streams. Like all migrating birds, warblers face numerous obstacles and hazards as they fly back south every fall after spending most of the spring and the entire summer spread across the United States and Canada for the season of nesting and raising young. Storms, such as the recent Hurricane Hermine, can be a hazard. Predatory raptors, like peregrine falcons and merlins, follow the migration routes and pick off various migrants. Even something as mundane as a window pane can bring a tragic halt to migration each year for thousands of our smaller songbirds. 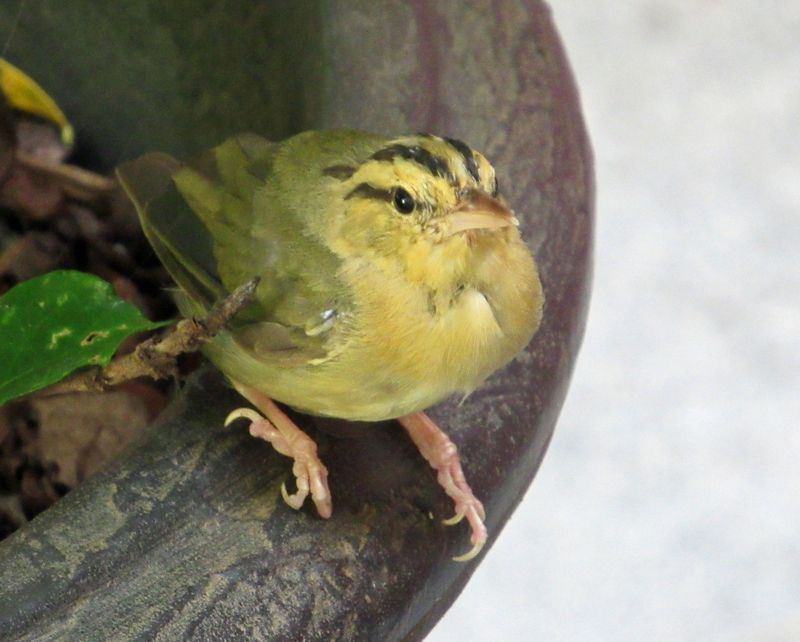 Photo Courtesy of Dianna Lynne Tucker This worm-eating warbler perched on a flower pot while recovering from an impact with a window. I recently received an email from Chris Soto, a fellow member of the Lee and Lois Herndon Chapter of the Tennessee Ornithological Society. Her sister, Dianna Lynne Tucker, resides in Elizabethton, Tennessee, near Holston Mountain. Her home has a yard that is a magnet for a variety of songbirds. One of the birds passing through her yard had an unfortunate impact with a window. Chris and Dianna already suspected the identity of the bird, but they emailed me asking for help to confirm it. I concurred that the bird was a worm-eating warbler. “After a brief rest, the bird recovered,” Chris noted in the email. I always like a story with a happy ending. The scientific name for this warbler is interesting. The worm-eating warbler, or Helmitheros vermivorum, is in a genus of one. It’s the only species contained within the genus. Vermi means “of or relating to worms” while vorum is related to eating. Hence, vermivorum is quite literally an “eater of worms.” The worms in this warbler’s diet, however, are not earthworms. Instead this bird feeds on caterpillars, the larval form of moths and caterpillars. The worm-eating warbler has one unusual foraging method to look for caterpillars. This warbler will often cling to a cluster of dead leaves while probing into the tangle to seek out any concealed caterpillars, as well as small insects and spiders. 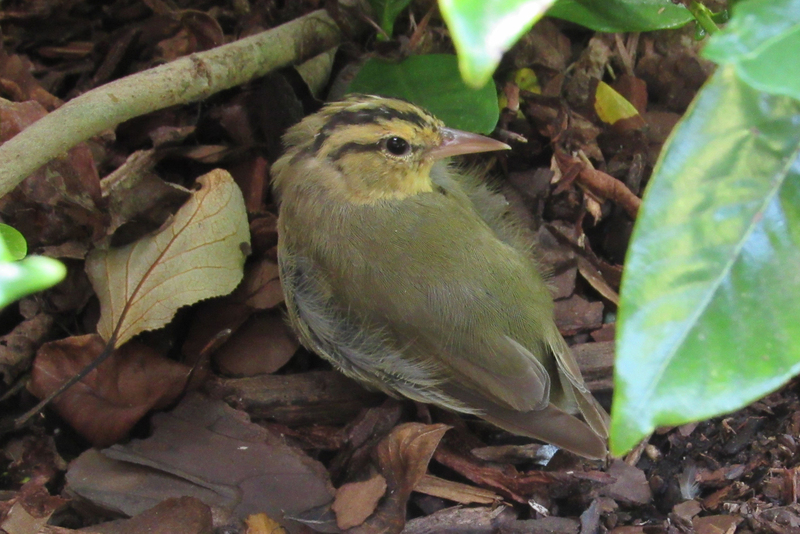 All in all, the worm-eating warbler doesn’t feed any more exclusively on caterpillars than other warblers. 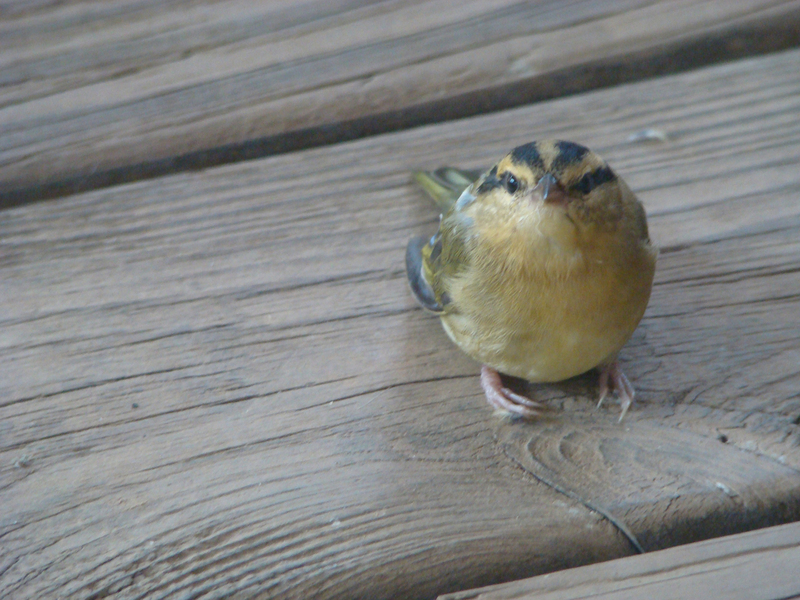 Photo Courtesy of Dianna Lynne Tucker Like other songbirds, the migratory worm-eating warbler faces many perils during its annual fall migration. This warbler’s non-musical song is a dry trill that compares with the songs of chipping sparrows and dark-eyed juncos. Since these other birds can be found in similar habitats, it can be a bit of a challenge for beginners to identify this warbler by sound alone. The worm-eating warbler isn’t one of the more colorful members of the family. It has a subtle beauty, however, with a plumage of brown and buff feathers. The most distinctive part of its appearance are the black stripes that run along the crown and a dark stripe through the eye. This warbler has a pinkish bill. Both males and females look alike. Photo Courtesy of Brian Rovira This worm-eating warbler recovered after striking a window at the home of Brian Rovira in Unicoi, Tennessee. According to the website All About Birds, the oldest worm-eating warbler ever documented was a male that was at least eight years, one month old when he was recaptured and rereleased during banding operations in Connecticut. I’ve seen fewer of this particular warbler over the past ten years, but the overall population figures for this species have actually trended slightly upward. 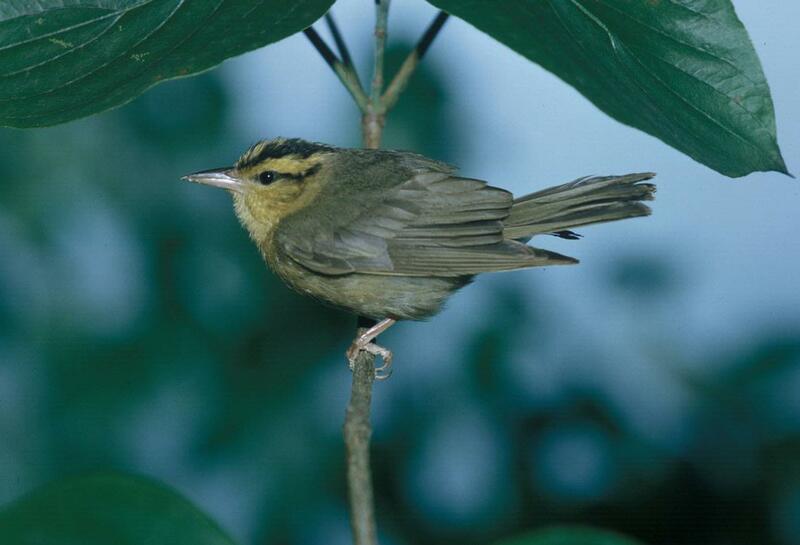 The worm-eating warbler’s population is concentrated in the southeastern United States. It favors deciduous woodland habitat with shaded banks, steep gullies and ravines. The habitat around my home must have changed enough that they are no longer a frequent visitor. The worm-eating warblers will migrate to Mexico and Central America this fall, electing to spend the winter months in warmer terrain. 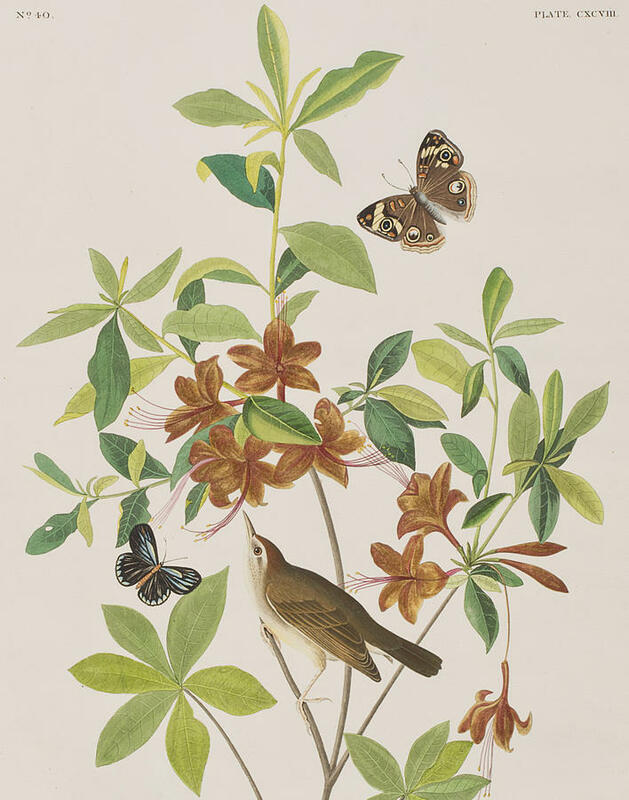 Early American naturalist and painter John James Audubon painted the worm-eating warbler in company with some native butterflies. Warblers and their active lifestyles can be a challenge for human observers. Nevertheless, it’s worth the effort to seek out these colorful, energetic and interesting songbirds. Many people like to look for returning spring warblers, but I’ve always found the fall season the best time to look for these birds. September is the month when the majority of these warblers will migrate through our region. Warblers ignore offerings of seeds at our feeders, but a bird bath, ornamental fountain, pond or stream is like a magnet drawing these migrants to stop, enjoy a cool drink and a vigorous splash in the inviting water. Keep a pair of binoculars at hand and your eyes open. If you’d like to share your observations of migrants passing through your yard this fall, I’d love to hear from you. This entry was posted in Birding, Birds, Songbirds, Uncategorized, Warblers, Worm-eating warbler and tagged Birding, birds, Birdwatching, Bristol Herald Courier, Bryan Stevens, Carter County Compass, Elizabethton Star, Erwin Record, Fall migrants, Fall migration, Feathered Friends, McDowell News, Northeast Tennessee, Our Fine Feathered Friends, Songbirds, The Erwin Record on September 18, 2016 by Bryan Stevens.